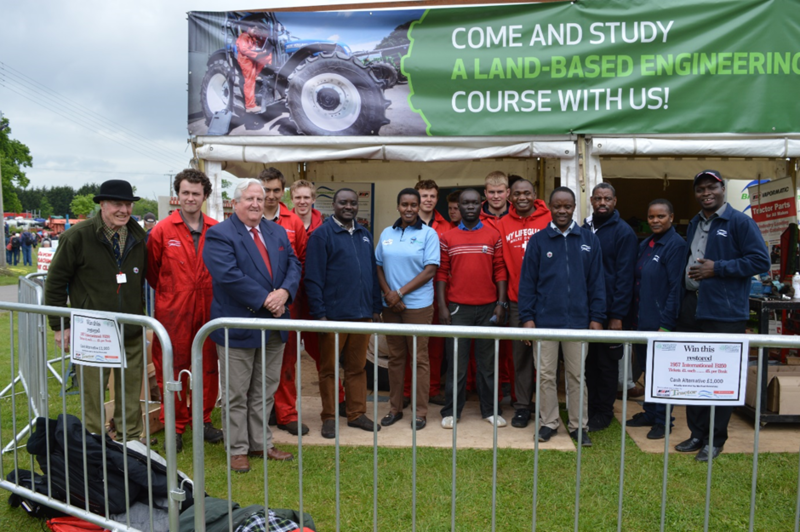 Delegates at Devon County Show with David Wendover, Mike Pash and the Engineers from Bicton College. This being B.O.A.T.’s 25th Anniversary Year plans were made to invite ten students to attend the 2016 Course in Institutional Planning and Business Management. After some initial delays and difficulties with Visas an impressive group of eight East Africans arrived for the start of the Course on 20th April. Due to changes in staffing at Bicton College it was necessary to find outside tutors for some of the Course topics. In addition to the usual visits the Course also visited the Exeter Meteorological Office and Maurice Retallick’s Dartmoor Hill Farm. The following eight mature students attended the 2016 Course. Catherine Mwangi, Executive Director, Anglican Development Services of Mt Kenya East. Michael Njagi, Project Manager, Livelihood Project, Anglican Church of Kenya, Siakago, Embu. Patricia Wangui, Project Manager, Biodiversity, Community, Carbon and Livelihoods Project, Zeitz Foundation, Nairobi. Jastus Obadiah, Programmes Manager, Rafiki wa Maendeleo Trust, Nairobi. Kennedy Adhola, Human Resources & Administration Officer, Rafiki wa Maendeleo Trust, Nairobi. Imani Sichalwe, Acting Head of Animal Production Department, Livestock Training Agency, Tengeru, Arusha. Albert Chonya, Veterinary Tutor, Livestock Training Agency, Madaba, Songea. Maxwell Mbweza, College Registrar, Natural Resources College, University of Agriculture and Natural Resources, Lilongwe. At the end of the Course at which all delegates passed a Questionnaire Survey revealed a most encouraging Feedback. On a scale of 1 to 6 the overall score for the Course was 5.6. This suggests that the Course was immensely valuable, highly relevant, & well implemented. There were requests for an additional topic of Project Management along with proposal making and donor report writing. Participation in the Learning Process scored 5.8. The Academic level of the programme for the delegates personal and professional needs was highly rated at 5.8. Visits were also highly rated at 5.8. Course organisation and administration scored 5.6. Hostel accommodation scored 5.5. Food and catering were stated to be “wonderful”. The External Examiner praised the experience, professionalism, & enthusiasm of the tutors, helpful and relevant assessment assignments, supportive feedback to the delegates and the way that the evaluation process continues to make improvements to the Course. As well as the six month feedback from the delegates there was a Managers Survey and Feedback. “The BOAT Course has immensely improved the outlook of our staff through interaction with the delegates”. Another comment from one of the delegates “Yes, we are busy, but we never stop reflecting on our great experience in the UK and how it has influenced our lives and the quality of our work”. The combined Course Presentation Evening and BOAT’s 25th Birthday Dinner held at Bicton College was graced by the presence of Jonathan and Jessica Dimbleby. Jonathan’s inspirational address was matched by Patricia Wangui’s equally inspirational reply on behalf of the delegates. 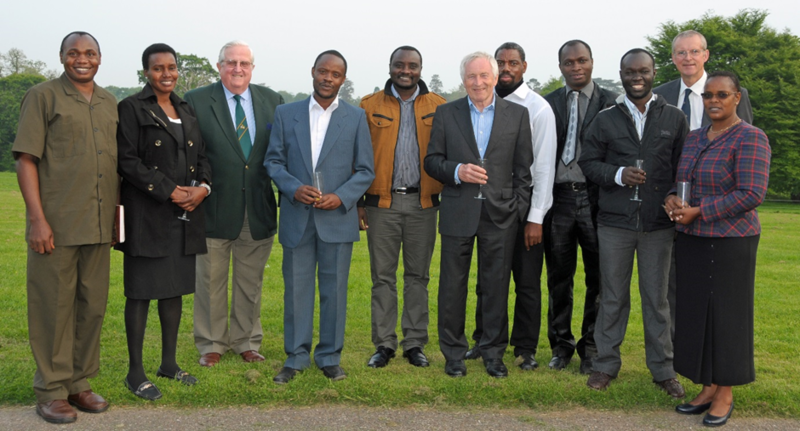 Delegates with David Wendover, Bill Vellacott and guest of honour Jonathan Dimbleby.